Do You Have Awful Tasting Water? Water in its pristine state is colorless, tasteless and odorless. There are several common contaminants that can make your water taste bad. To get great tasting water first we have to know what is causing the bad taste. Chlorine is a disinfectant. It plays a crucial role in making sure that municipal supplies are able to deliver safe water for you and your family. Chlorine allows water to be transported over vast distances through large networks of distribution lines safely and cost effectively. Many people choose to remove the chlorine once it reaches their home. Chlorine removal can make your water taste better and can eliminate dry hair and skin problems that are often associated with chlorinated water. We often hear complaints about water that has a metallic taste. In Ohio, it is not unusual to encounter well water with naturally occurring iron and manganese. Aside from the unsightly stains that these contaminants might cause, they can also contribute to a metallic taste and/or odor in water. Sulfur and certain types of bacteria can cause well water to not only smell bad, but to taste awful as well. Without testing the water, it is impossible to know whether the “rotten egg” taste and odor is caused by sulfur or bacteria. Whatever the cause, this may be the worst of all of the symptoms that we treat. 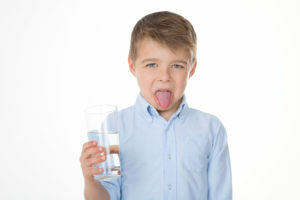 If your water has any of these unpleasant tastes, contact your local Peacock Water professional to arrange for a free, in-home water analysis.